In April 2014 the Tory led government introduced a new punishment regime for the unemployed called "Help to Work". The scheme uses the threat of absolute destitution (via benefits sanctions) to compel the long-term unemployed into giving up their labour rights and working for no wage. 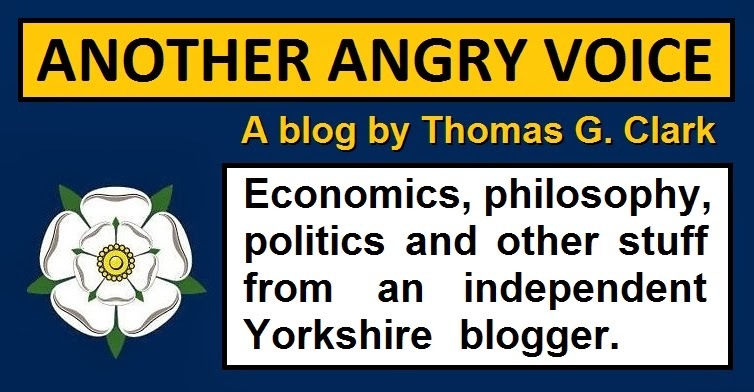 In this article I will outline 12 significant criticisms of the scheme, and the misleading way it has been presented to the public. The first thing to note is that, like so much Tory party policy, the presentation of this new forced labour scheme relies on the use of overtly Orwellian language. The Tories decided to officially launch their so-called "Help to Work" scheme, despite the fact that the fundamental details of the scheme had yet to be formalised, and remained shrouded in secrecy. The identities of the companies bidding to run these these lucrative £300 million modern-day workhouse schemes remained a complete mystery until after "Help to Work" was officially launched. Do they really expect the public to believe that these opportunistic workfare companies have somehow instantaneously secured the infrastructure and trained sufficient gang masters to deal with a workload of some 200,000 long-term unemployed? Another implication arises from the fact that all the long-term unemployed that have no mandatory work placements to go to will be forced to sign on every single day. This means that the workload of Jobcentre staff will be massively increased. According to Jobcentre sources, the DWP only bothered to begin consulting Jobcentres over staffing and Health and Safety issues relating to this vastly increased workload in the week before they officially launched it. Using the threat of absolute destitution (via sanctions) in order to compel the unemployed to work for no wage is a clear and undeniable attack on the labour rights of the individual. It is absolutely obvious that these mandatory unpaid labour schemes undermine the National Minimum Wage, because the victim must work 30 hours a week without a wage. However this isn't the only way in which these workfare schemes attack labour rights. Once the victim is sent on their unpaid forced labour scheme, the threat of absolute destitution can be used by their gang master to bully and intimidate them into carrying out dangerous, disgusting, degrading or debilitating work. If the victim refuses to do anything they're told, their gang master can simply report them to the DWP (or Work Programme provider) and ensure that they lose their pitiful subsistence benefits and suffer destitution. Then they can simply order another replacement victim to carry out the work instead. One of the most compelling arguments against these schemes, which appeals strongly to people from across the political spectrum, is that forcing the unemployed to work for the social security payments they've already paid for through National Insurance contributions is a fraud. The whole idea of National Insurance is that it is paid by the public in order to provide a social safety net. Millions of people have paid into the National Insurance pot on the understanding that these payments would provide them with social security should they lose their job. Now the Tories have rewritten the rules so that people lose their eligibility to receive their National Insurance payouts unless they comply with their draconian new rules, which include participation in lengthy unpaid labour schemes. When the banks played a similar trick on the public by compelling them to buy useless PPI "insurance" on their loans, the fraud was eventually exposed and they were made to pay back their ill-gotten gains. The Tories have no worries about engaging in a similar kind of fraud to the banks because they know from experience that even if the courts declare that their actions are unlawful, they can simply collude with the Lib-Dems and the Labour party in order to retroactively rewrite the law, so that their unlawful actions would have been lawful had the legislation been written that way in the past. The Office for National Statistics openly admits that it does not count the victims of mandatory unpaid labour schemes as "unemployed", even though these people are still in receipt of unemployment benefits, and have no actual salary paying jobs. In the April 2014 Labour Market Statistics bulletin, the ONS admitted that 135,000 unemployed people were artificially excluded from the headline unemployment figures because of their participation in "Workfare" schemes. The launch of "Help to Work" will help the Tories to further obscure the true scale of unemployment by excluding hundreds of thousands more long-term unemployed people from the official unemployment figures. One of the cherry-picked statistics the Tories used to decorate their launch was the absolutely extraordinary claim of the biggest fall in long-term unemployment since the 1990s. It is clear that the long-term unemployment figures are hugely distorted by the aforementioned trick of excluding the victims of forced labour schemes from the calculations, but even taken at face value this claim of a huge drop in long-term unemployment is appallingly disingenuous. Comparison between the official Labour Market Statistics from April 2014 and the data from the same period in 2010 show us that since the Tories came to power, general long-term unemployment (2 years plus) has risen 58% from 272,000 to 430,000, and youth unemployment (2 years plus) has risen 76% from 59,000 to 104,000. It takes a thoroughly dishonest individual to dress up such an appalling track record of failure as some kind of historic success, so it is quite appropriate that this utterly misleading example of statistical cherry-picking was presented by the notoriously dishonest Iain Duncan Smith. One of the saddest things of all is that even the (supposedly left-wing) Guardian newspaper quoted Iain Duncan Smith's blatantly cherry-picked claims verbatim without the faintest effort to put them into any kind of appropriate perspective. The Tories love to create the propaganda narrative that their various forced labour schemes are designed to help people find work, however there is plenty of evidence to show that forced labour schemes don't work. "Employment minister Esther McVey insisted on the Today programme that the scheme was not about "punishment" but about 'getting people into work and fulfilling their potential'. Yet even if we take her rhetoric at face value, how helpful is Help to Work likely to be? Judging by the DWP's pilot scheme (the results of which, as Jonathan Portes notes, it has avoided publicising), the answer is 'not very'. The DWP took 15,000 claimants and placed them in either the jobcentre programme, the community work scheme, or a control group. At the end of the pilot, it found that the same number in the control group (18 per cent) found employment as those doing workfare and that just 1 per cent more of those receiving jobcentre support did. In other words, Help to Work made almost no difference. Yet despite this, the government has proceeded to extend the £300m programme nationwide without any cost-benefit analysis. It is another triumph of politics over policy. " "There is little evidence that workfare increases the likelihood of finding work. It can even reduce employment chances by limiting the time available for job search and by failing to provide the skills and experience valued by employers. Subsidised ('transitional') job schemes that pay a wage can be more effective in raising employment levels than 'work for benefit' programmes. Workfare is least effective in getting people into jobs in weak labour markets where unemployment is high." So despite knowing that workfare didn't work abroad and watching the abject failure of their "Help to Work" pilot scheme, the Tories are still pressing ahead with their £300 million project, and continuing to spread the lies that these schemes are designed to help people find real work when they demonstrably do no such thing. It is absolutely clear from the failure of their pilot scheme that the main beneficiaries of the £300 million "Help to Work" scheme will be the corporate outsourcing parasites that are soaking up ever larger amounts of the welfare budget, which is actually meant to support the poor, not to subsidise the balance sheets of parasitic corporations. The rogues gallery of outsourcing profiteers that run the fraud riddled Work Programme (Atos, A4E, Ingeus, G4S, Serco, Avanta, Seetec) will get cash every time they place an unemployed person on one of these forced labour schemes. Then more taxpayers' cash will be handed out to the companies that actually administer the forced labour schemes. These "Help to Work" contractors include G4S, Seetec, Interseve and Pertemps. It is worth noting the blatant conflict of interests arising from Work Programme providers such as G4S or Seetec getting paid by the taxpayer for placing individuals on "Help to Work" schemes run by G4S or Seetec, which are funded by the taxpayer. One of the most appalling things is the fact that G4S have recently been caught stealing £109 million from the taxpayer via a massive electronic tagging fraud. Not only were they allowed to just pay back the money they stole without criminal prosecution, here they are being awarded even more lucrative government contracts just a few weeks later. As I mentioned in the opening section on the use of Orwellian language, the Tories love to dress up these mandatory labour extraction schemes as voluntary, even though the threat of absolute destitution (via sanctions) is used to intimidate people into participation. The thing that really makes this propaganda narrative so distasteful is that the DWP actively prohibits people from undertaking genuine voluntary work, with rules that state that if the claimant does voluntary work, they are deliberately making themselves unavailable for work, which is a sanctionable offence. Another appalling example of this DWP contempt for genuine voluntary activity is the case of army veteran Stephen Taylor who was punished with four weeks of sanctions for the crime of selling poppies for a few hours a day in the two weeks before Remembrance Sunday, despite also applying for dozens of jobs too. We are clearly living in an Orwellian dystopia when the government keep insisting that their forced labour schemes are voluntary**, whilst simultaneously punishing people for engaging in genuine voluntary activity with harsh benefits sanctions. It is the official policy of the establishment (the Bank of England, the DWP and the government) to drive down wages and working conditions by creating false abundance in the labour market via political and economic policies aimed at retaining a constant pool of unemployment, the "reserve army of unemployment" as Marx defined it in the 19th century, or the "price worth paying" as it was described by former Tory Chancellor Norman Lamont in 1991. What the Tories have realised is that maintaining this vast pool of unemployed people in order to drive down wages is a wasted opportunity. Instead of simply paying them a pitiful subsistence income to keep them alive and available for work, they have devised these schemes to extract their labour for free. It's bad enough that the establishment have devised an economic system that requires millions of people to suffer unemployment, poverty and welfare dependency in order to support vested capitalist interests, but now they have decided to go one step further by treating the people they have deliberately trapped in unemployment as a free source of labour. Is unemployment worse than crime? Given that the political and economic policies of the establishment are designed to maintain a perpetual reserve army of unemployed in order to drive down wages, it is extraordinarily harsh for government ministers to then berate unemployed people as "scroungers" and "skivers" for finding themselves without work. What is even worse is the efforts to punish the reserve army of unemployed with forced labour schemes. One of the most appalling aspects of "Help to Work" is that it allows corporate outsourcing profiteers like G4S to sentence the unemployed to up to six months of unpaid labour. 30 hours a week for six months adds up to 780 hours. To put this into perspective, the maximum community service sentence that can be imposed on convicted criminals is 300 hours over a 12 month period, and the average forced labour sentence imposed on convicted criminals is just 110 hours over 12 months. It is absolutely extraordinary that the unemployed (who find themselves jobless due to the macroeconomic policies of the ruling establishment) can be sentenced to almost triple the maximum forced labour punishments handed out to convicted criminals, and more than seven times as much forced labour as the average community service sentence. One of the most infuriating things about the dumbed-down level of political discourse in the UK is the refusal/inability of people to view politics from outside the tribalistic and outdated left-right political spectrum. Many people tend to think along the lines of left=good, right=bad, or vice versa, however history has shown time and again that governments from either side of the political spectrum are equally capable of committing atrocities against their people. In my view the defining characteristics of 21st Century governments will not be how left/right they are but how liberal/authoritarian they are. Where our governments stand on the rights and liberties of the people they supposedly represent will be much more important than their views on who should control the means of production. The Tory enthusiasm for Stalinist style labour extraction schemes is a clear demonstration of where they stand on the rights and liberties of the public. These schemes rely on the assumption that the labour of the individual doesn't actually belong to the individual, but that it belongs to the state, to be extracted and distributed for free to favoured corporations (such as the gigantic US private equity fund Warburg Pincus - which owns Poundland). The Tory contempt for the rights of the public is illustrated by their oft stated desire to withdraw from the European Convention on Human Rights (our rights should be scrapped), whilst ministers simultaneously make public declarations that the government has "a right" to extract the labour of the individual for no remuneration. (their rights are asserted). When the government is intent on using the threat of absolute destitution (poverty, hunger, fuel poverty, homelessness) in order to extract the labour of the public, it is absolutely clear that they have absolutely no regard for the concept of liberty. "Help to Work" and the numerous other Tory forced labour schemes provide clear evidence that these people are fanatical authoritarians with no respect for the rights and liberties of the public. The sad thing is that both the Liberal Democrats and the Labour party have also colluded with the Tories in support of these forced Labour schemes, meaning that just a few minor parties have actually expressed any kind of explicit criticism of this kind of totalitarian state administered aggression. The honorable parties include the Scottish National Party, Plaid Cymru and the Green Party. The Green Party stance is particularly interesting because of their support for the idea of Universal Basic Income, which would make these kinds of draconian forced labour schemes completely unworkable, by virtue of making welfare universal and unconditional. When the government is determined to use the threat of absolute destitution in order to extract free labour from the public, whilst rewarding the gang masters that run these schemes with hundreds of millions of pounds, it is absolutely clear that these people have deeply illiberal attitudes about state ownership of the labour of the individual. These people don't believe that they are there to serve the public, they believe that the public are there to serve them. Forced labour schemes like "Help to Work" are based on ideology not evidence. They are deeply flawed in conception and in implementation. The thinking behind these projects is extremely illiberal (that the state owns the labour of the individual) and the implementation is just as illiberal (compelling people into giving up their labour with the threat of absolute destitution). The presentation of these schemes is clearly Orwellian, with words divorced from their actual meanings against a backdrop of absurdly cherry-picked statistics. 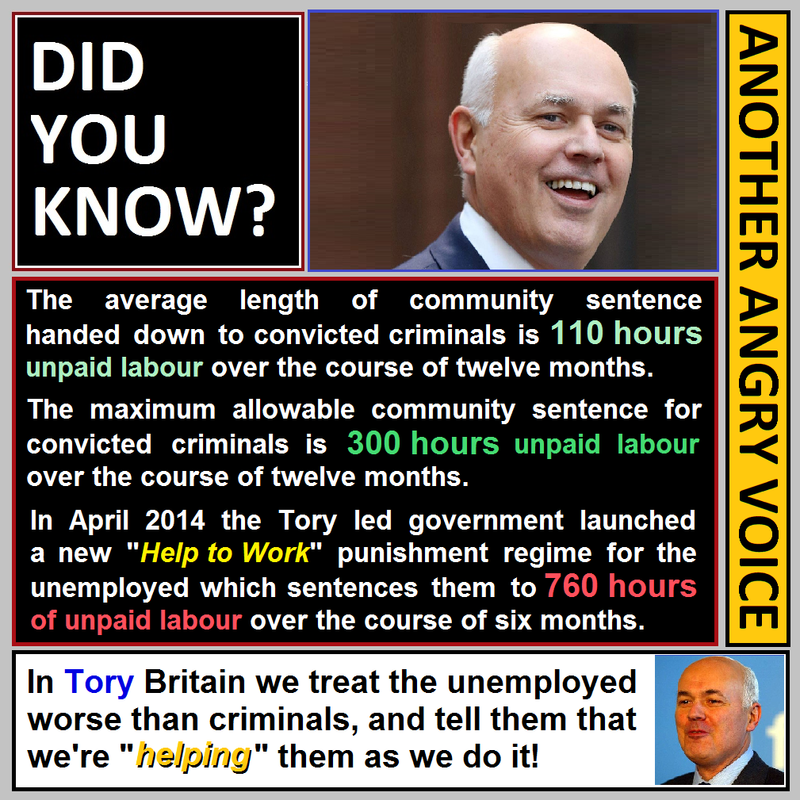 Some of the worst aspects include the fact that unemployed people who refuse to go on these supposedly "voluntary" forced labour sentences that far exceed anything imposed upon convicted criminals, and the fact that the Tories and the DWP treat people that engage in genuine voluntary work with absolute contempt and harsh benefits sanctions. The Orwellian "Help to Work" scheme is so malicious and economically illiterate that I have had no problem at all compiling 12 major criticisms for the purposes of this article, however this is not an exhaustive critique so if you have any other criticisms of the scheme, feel free to add them in the comments section. * The Cait Reilly judgement provoked an extraordinary rant from Iain Duncan Smith in which he displayed the enormous chip on his shoulder about graduates, presumably something to do with the fact that he got caught out adding fake graduate qualifications from imaginary universities to his CV back in 2002. ** One of these supposedly "voluntary" Workfare schemes is even called Mandatory Work Activity!